In just over three years, real estate giant Tishman Speyer and its partner, BlackRock, lost billions of investors' dollars on a single deal. 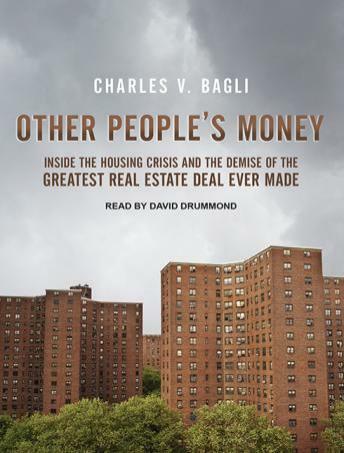 In Other People's Money, Charles V. Bagli, the New York Times reporter who first broke the story of the sale of Stuyvesant Town-Peter Cooper Village takes listeners inside the most spectacular failure in real estate history, using this single deal as a lens to see how and why the real estate crisis happened. How did the smartest people in real estate lose billions in one single deal? How did the Church of England, the California public employees' pension fund, and the Singapore government lose more than one billion dollars combined investing in a middle-class housing complex in New York City? How did MetLife make three billion dollars on the deal without any repercussions from a historically racist policy of housing segregation? And how did nine residents of a sleepy enclave in New York City win one of the most unlikely lawsuits in the history of real estate law? Not only does Other People's Money answer those questions, it also explains the current recession in stark, clear detail while providing riveting first-person accounts of the titanic failure of the real estate industry to see that a recession was coming. It's the definitive book on real estate during the bubble years-and what happened when that enormous bubble exploded.